The Long John Silver Trust has been formed to create an innovative sculpture of fiction's most famous rascal (he also happens to be Bristol's most famous pub landlord). This has evolved into a revolutionary idea for further artworks on Bristol's Harbourside that will tell the whole story of Stevenson's classic novel - THE BRISTOL TREASURE ISLAND TRAIL. 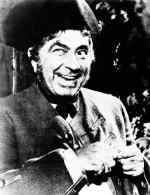 Robert Newton played Long John Silver in the childrens' TV series. --So be it, and fall on!